The high-kicking Happy Hoofers–Tina, Janice, Pat, Mary Louise, and Gini–have been booked to flaunt their fabulous flamenco footwork on a luxury train ride through northern Spain. But when a blowhard talk show host is found deader than four-day-old flan–with Gini as suspect numero uno–the feisty friends waste no time stepping into their sleuthing shoes to protect one of their own. 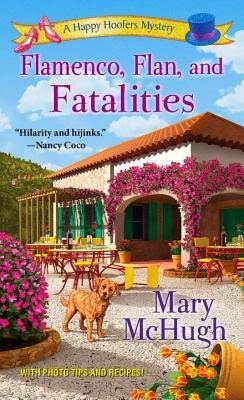 Win one of five print copies of this great cozy mystery! I need to catch up on this series. I feel as if these ladies could be my pals.